Western Massachusetts didn't go very long without a hockey franchise. 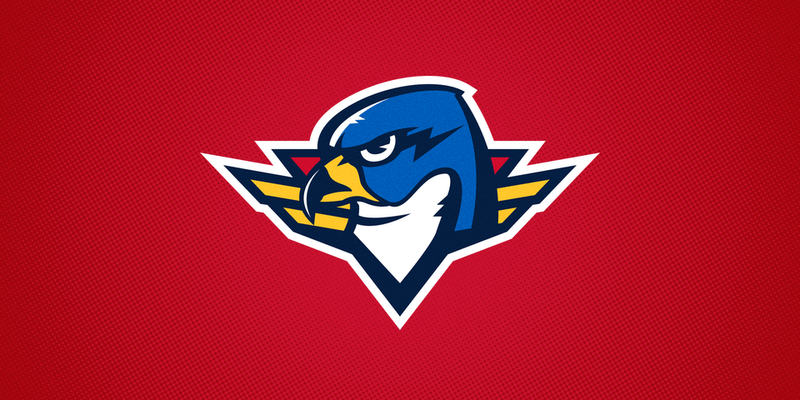 Not two months after the relocation of the Falcons, the AHL welcomed the Springfield Thunderbirds today. It's a cool new identity and if its style looks familiar — well, it should. Today's logo reveal might be the most exciting announcement I've ever reported on — simply because of the story of the guy who designed it. Regulars to the site know Matt McElroy very well. His contributions to the Concepts page and yearly design contests for our IceHL fantasy league are legendary. He currently has more winning logos in the project than any other artist. Clearly, this community loves his work. And we're not alone. Springfield Hockey, LLC approached Matt in May, as they acquired and relocated the Portland Pirates franchise. Believe it or not, they wanted him because of a Seattle Thunderbirds concept he submitted to Icethetics almost three years ago! The Thunderbirds came looking for Matt after they saw this concept. This really is the dream for our contributors, isn't it? Get your work featured on Icethetics, then have a pro team come knock on your door! Time was tight as Matt jumped on board because Reebok production deadlines were long passed. But he's no stranger to quick turnarounds. During IceHL design contests, artists typically get only a couple weeks to create and submit their work — though they do it without the paying client. I had a chance to talk with Matt about his involvement in the newest AHL identity and his insights are fascinating. He told me the name Thunderbirds was a tribute to Springfield's hockey history — with the city's most recent teams, the Falcons and Indians, in mind. "The logo is facing to the left," Matt said, "because the original Indians and Falcons logos faced to the left." He added: "The lightning bolt at the bottom is supposed to be an 'S' and originally it was much more prominent." Much like their NHL affiliate, the Florida Panthers, the Thunderbirds used military insignia as the design inspiration. Matt even said he and the team went back and forth over whether to use the new Panthers gold in the club's color palette. In fact, the full branding package still isn't complete. Much like the SPHL's Columbus Cottonmouths — another pro logo by an IceHL artist — Matt and the Thunderbirds are still "tinkering" on secondary marks, which will be released at a later date. But one thing you don't have to wait for is an exclusive sneak peek inside Matt's sketch book! It's impressive to see how far Matt has come — even more impressive when you see where he began. I love telling this story because it shows what can be achieved with commitment to a goal and dedication to a craft. One of the first concepts Matt ever submitted was a Los Angeles Kings third jersey delivered in December 2009. I posted it to the site on Jan. 8, 2010 alongside a scathing critique — right at the bottom of a Freak Out Friday entry. "This jersey design needs to be buried," I wrote. "Deep." I called it the "dictionary definition of ugly." In my defense, he did ask in his email for me to tell him what I thought of it. So I didn't hold back. At that point, this was the last guy I ever would have expected to end up designing logos for professional hockey teams. If he had asked me then, I would've suggested he take up a new hobby. My comments had the opposite effect on Matt. Over the next few years, he continued contributing concepts here and there, improving with each design. Then in 2012, he told me about the embarrassment of his Icethetics debut and how it galvanized him to improve his skills. And finally, he revisited his Kings' third jersey. So let this be a lesson to kids of any age: You want something? Make it happen. In 2013, Matt took his skills to the next level by winning over IceHL fans in a big way. We held fan-voted logo design contests for 11 fantasy hockey teams. He won five of them with stiff competition. A year later, he won two more contests and today holds the league record with seven winning logos. He also has four wins in the jersey design department for good measure. Now his rock star status on Icethetics has finally gotten noticed in the real world. 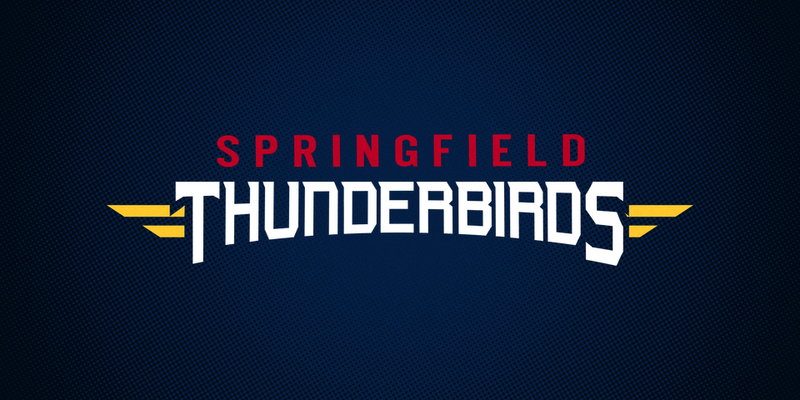 Trust me when I tell you that the Springfield Thunderbirds are only the first of many teams to have their logos designed by the incomparable Matt McElroy. I can't wait to see who's next.